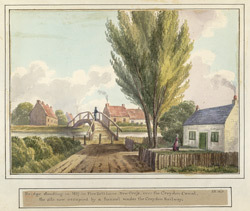 View of a bridge over the Croydon Canal at Five Bells Lane, near New cross. The Croydon Canal opened in 1809 and linked the Thames to Croydon via Forest Hill, Sydenham, and Anerley. The project proved a financial failure and it was closed in 1836 when the proprietors sold the canal for use as the course of the London to Croydon railway. Today the line from London Bridge to West Croydon follows the route of the canal for much of the way.